Did you see the recent documentary where they suspect that the bunker fire had buckled the bulkhead just where the iceberg was due to strike? Was very interesting but didn't tell me anything that I didn't already know! I read the entire testimony of the US Senate Investigation and The British Board Of Trade Inquiry. The stokehold fire was if memory serves brought up during the BBofT hearings. If the fire had compromised that bulkhead that would explain a lot about the progressive flooding aft. One will never know. My personal belief is that the damage forward of that bulkhead was more severe than Smith and Andrews knew. Granted the flooding from the glancing blow of the starboard shell plating was extensive I believe she grounded on an out crop of ice and ripped out her bottom plating. The depth of the flooding in the mailroom and hold so quickly after the collision tells me the damage was far greater than realized. She flooded far to quickly from sprung plating and popped rivets. Given she was new and the crew weren't that familiar with her and apparently no attempts were made to investigate her lower forward compartments we again will never know. This is totally my opinion though so I stand to be corrected. There are three programmes on "QUEST" on Saturday night about Titanic. Two of them havn't been on before, I believe. Thank Pete. I'll Google around and see if I can find them here in Trumpland. You think Her Magesty's Govt. might relax immigration for ..... me? It took me a bit of searching but I've found 2 Titanic Specials on Saturday night here. They may be repeats but I'll be watching anyway. I believe one of them has to do with the stokehold fire. It should be interesting to watch. It's been said for years that the boiler room bulkhead collapsed speeding the sinking. If it had held, could Carpathia have arrived in time to take on all the passengers? So many unanswered questions. Over the weekend I finally got the hull mounted to it's base. This is a big model so I wanted something a little more substantial the the rickety plastic base that came with the kit. So I being a woodworker, cut and routed a piece of oak 20" long and 6" wide. After some stain and 2 coats of semi gloss poly, I have a base. 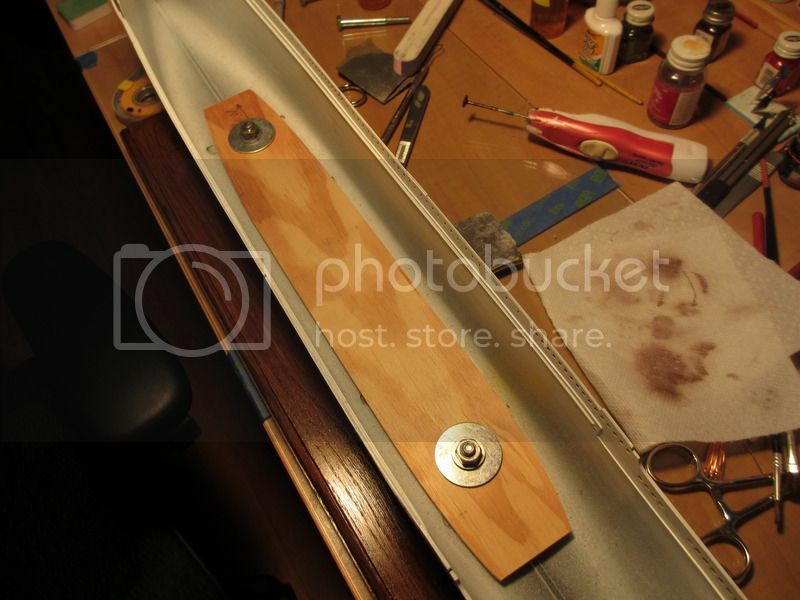 Here's some pictures of the hull mounted to the base, and the interior shots of how it all came together. The next major step will be mounting the main deck to the hull. I have dry fitted several time just to get a feel for how to procede. It goes in in two pieces two long very flexible pieces. Did i mention the hull is a half an inch wider than the deck? no Vic shoe horning here! got my clamps and tension bars at the ready. 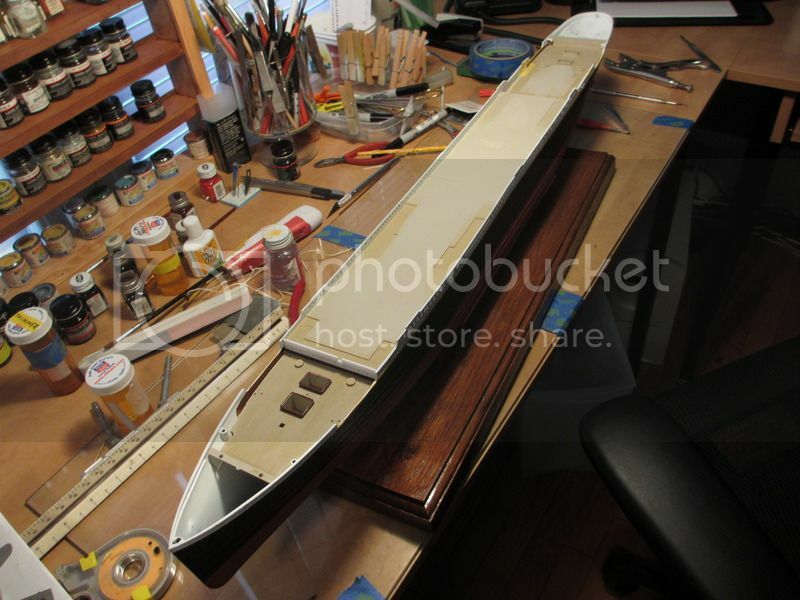 Thanks Pete!Last night I got the main deck glued into the hull. Another long process. 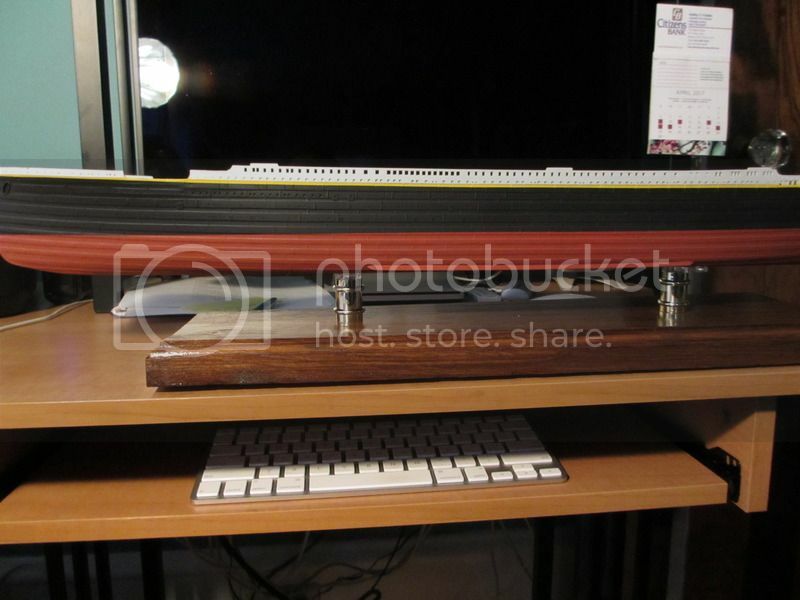 The deck is in two pieces of long very flexible styrene. 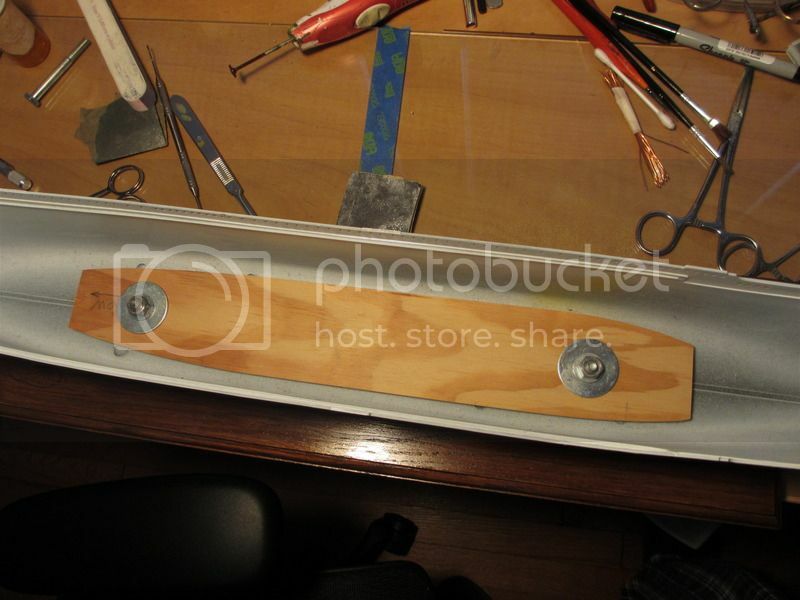 Of course the hull is wider than the deck, so it was glue-clamp a couple inches at a time. Down on side and then the other. All told that amounted to 50 and one half inches. Each side got attached with MEK and clamped till it was bonded and then a thin bead of CA was run along the seam applied with a thin wire applicator. I must apologize for not taking pictures during the process but I really had both hands full. Looks like you got things zipped up pretty well.